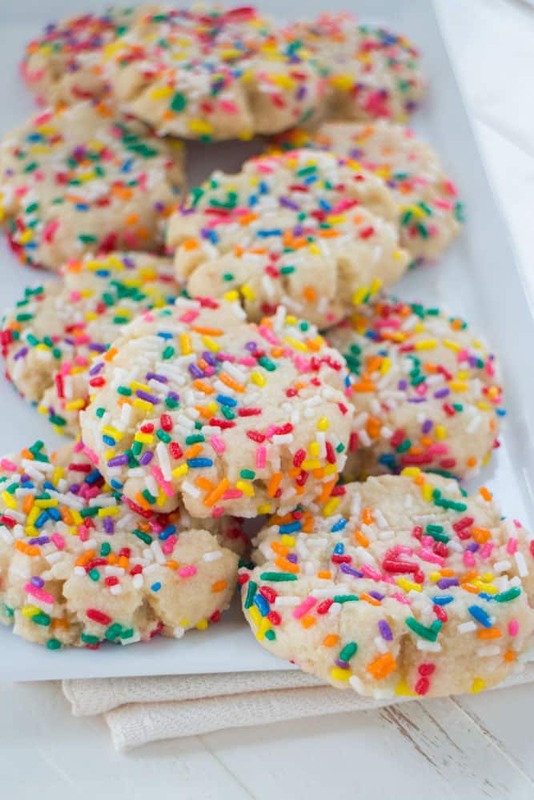 Rainbow Sprinkled Butter Cookies Recipe - So soft and easy to make! 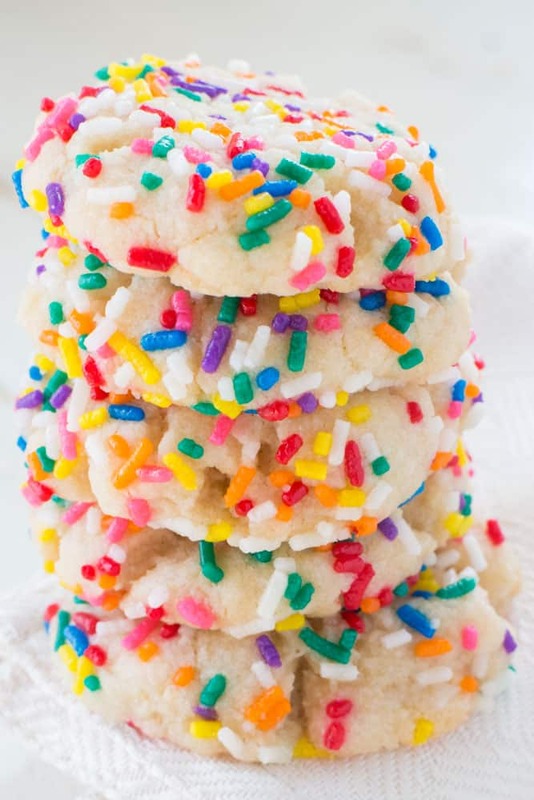 RAINBOW Sprinkled Butter Cookies! They taste like Funfetti Butter Cookies! These delicious cookies are easy to make and uses evaporated milk to make the cookies extra soft! They melt in your mouth! Roll them around in colored sprinkles to make them more fun! Recipe makes 2 dozen cookies. I don’t know what it is about July but I usually start thinking about holiday season around this time of the year. Between me going to the library to check out a Christmas stories book, a friend telling me she’s already begun her shopping and my craving for cookies, I believe I have the “Christmas In July” fever! Dreaming of a tin cannister of Christmas cookies led me to make these Sprinked Butter Cookies which are delicious (and very pretty!). The ingredients list is short and simple, using butter as the main ingredient that keeps them soft. They’re also so easy to make! 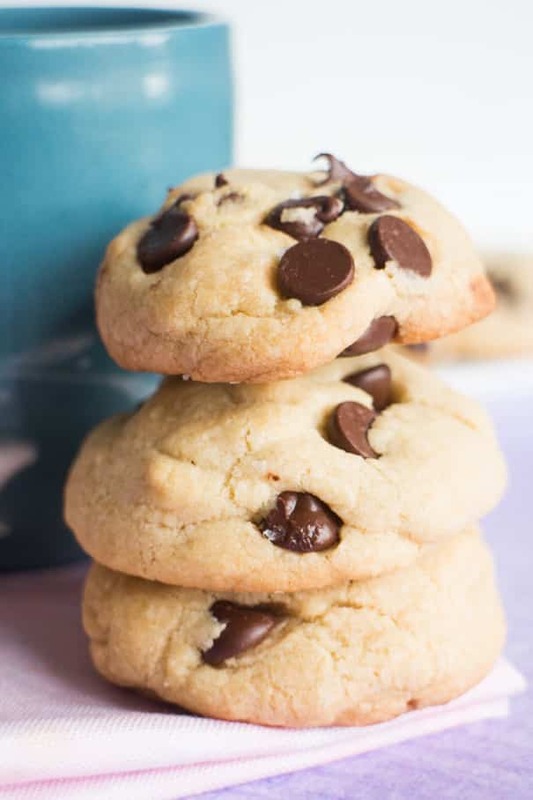 In fact, they’re now one of my favorite go to cookie recipes when I’m in a pinch and need to make a batch of cookies quickly! 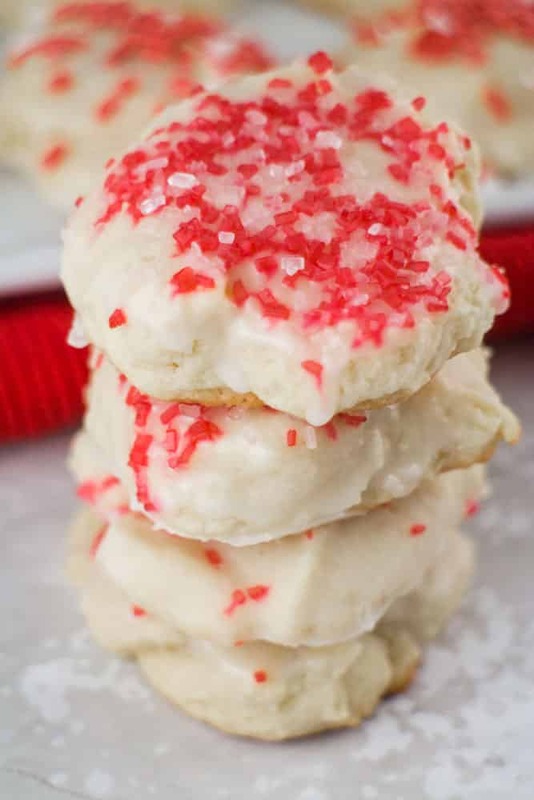 The other key ingredient for these Sprinkled Butter Cookies is evaporated milk which is going to keep them fluffy and tasty. 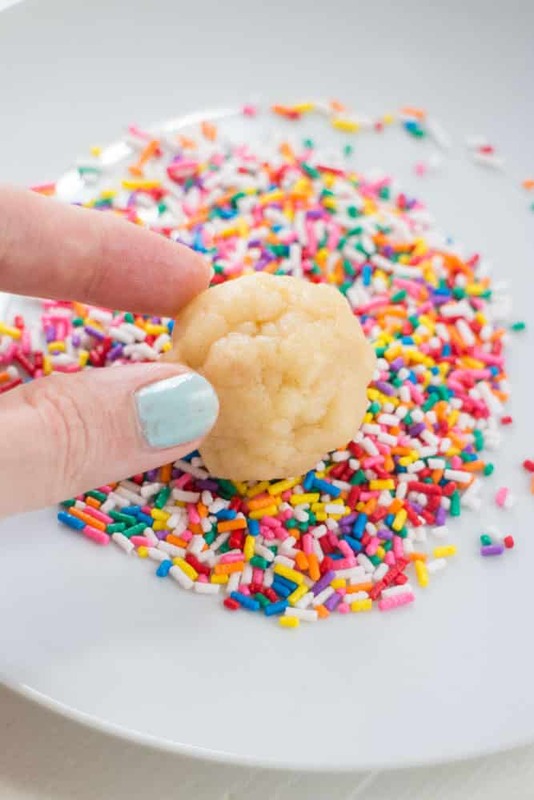 Roll around in your favorite colored sprinkles and you have a festive butter cookie – perfect for the holiday season or whenever you’re craving a cookie! See, I would never lie to you about cookies. They are super soft inside! Now let’s get baking these Sprinkled Butter Cookies! 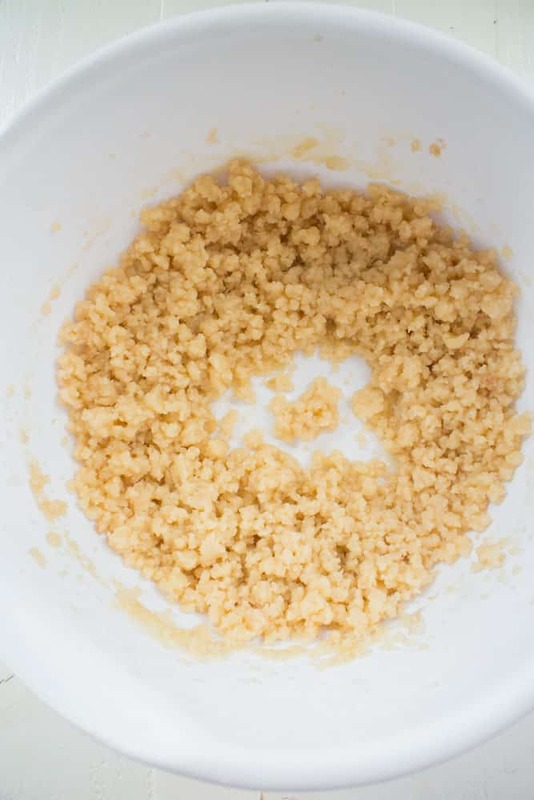 You’ll want a crumbly cookie dough mixture, it should resemble something like this. Pour sprinkles on a plate or a shallow bowl. I used rainbow sprinkles but you can use whatever color you want depending on the occasion. Roll each cookie into a tablespoon sized ball. Now roll it in the sprinkles so the dough is coated. Add cookies to your baking sheet. And then gently flatten each cookie with a back of a spoon. Bake at 320 degrees (not a typo, we want to bake them at a low temperature for longer) for about 17-20 minutes. And out of the oven comes some beautiful Sprinkled Butter Cookies! 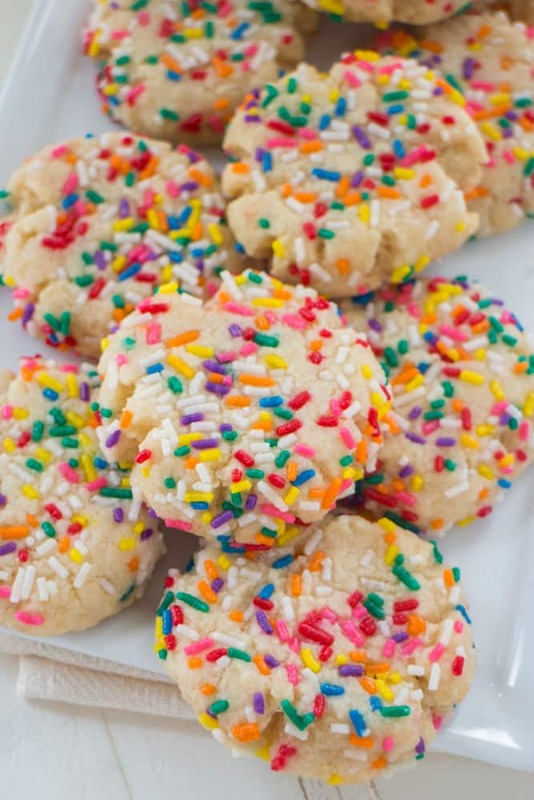 Hope you enjoy this Sprinkled Butter Cookies recipe! 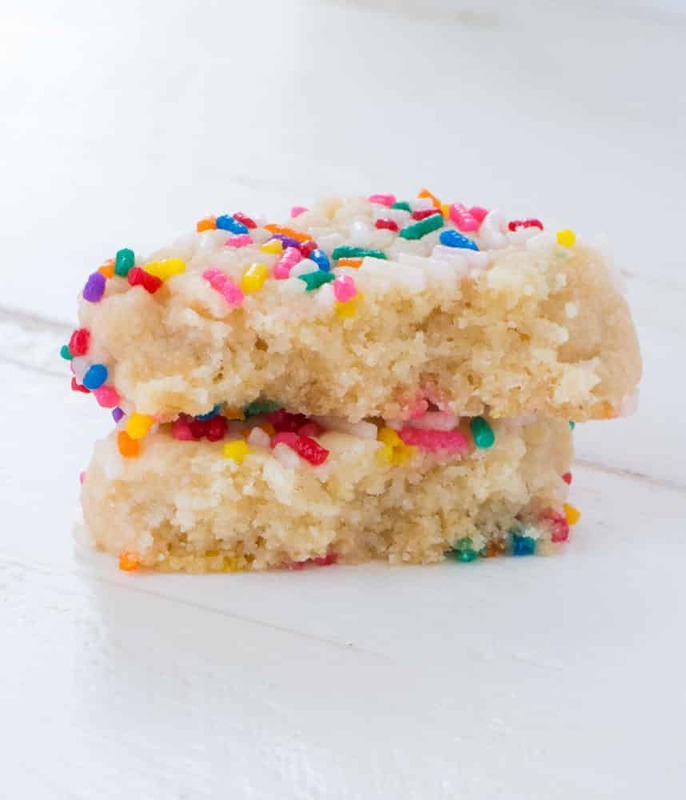 If you’re looking for more sprinkle recipes make sure to try my Birthday Cake Muffins and Confetti Cake Batter Brownies! Add flour, baking powder, vanilla and evaporated milk. Continue to mix until crumbly. 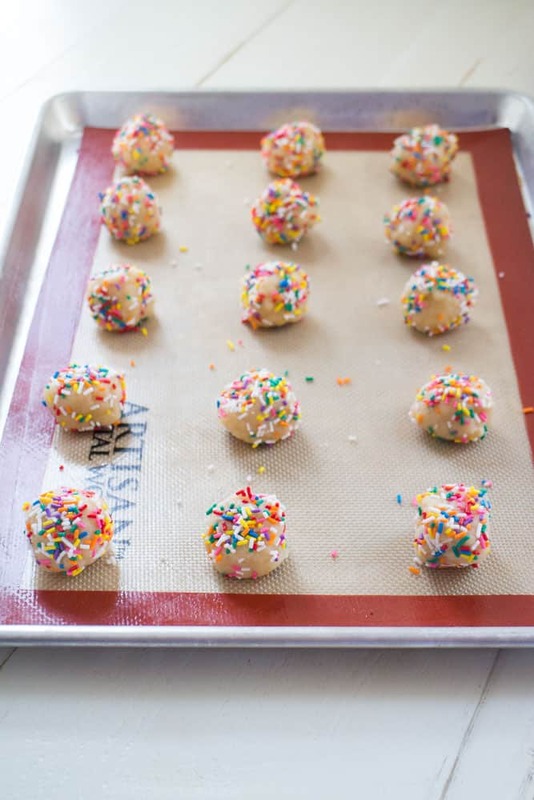 Roll dough into tablespoon sized balls and then roll around in sprinkles to completely coat. Continue to do this until all your dough is gone. 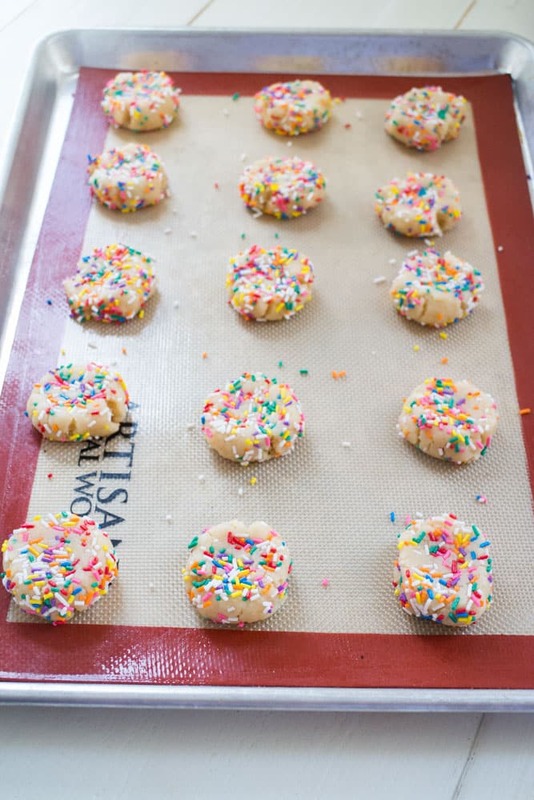 Place cookies on a cookie sheet that's been sprayed with nonstick spray or place on a silicone baking mat. Very gently flatten each cookie with the back of a spoon. Let cookies cool for 15 minutes before eating. Store in airtight container for longer storage. You can freeze this dough for later use. Just defrost before baking. Looking for more cookie recipes? Try my.. I was just thinking that I need to get started on planning holiday recipes… which seriously scared me! But also, the Hallmark Channel is playing nonstop Christmas movies. These cookies look gorgeous and delicious no matter the season! What a fun little cookie! I bet these would go down very well at a kid’s birthday party! I usually wait until Labor Day before I start thinking of the holidays. No reason not to get an early start, though! These look terrific. Perfect reward after a long day harvesting goodies from your garden! I do like a cheerful cookie. In July I notice holiday rumblings in the catalogs that are in my mailbox. These little gems would be a perfect addition to a cookie gift box. These are so pretty and the also look delicious! These look delish, and not overly sweet. I was looking for something fun to make this week. I think these are it! Thanks! I want to make love to those cookies LMFAO! Oh, I want one of these cookies right now! 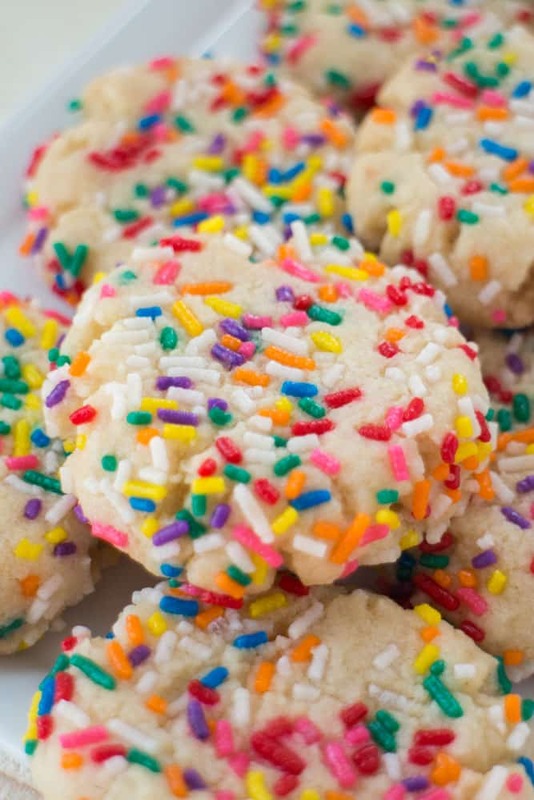 I love butter cookies, and sprinkles make everything better. Thanks for sharing at #HomeMattersParty. I love these happy little cookies! Thanks for linking up with What’s Cookin’ Wednesday! Wow! My mouth is watering. I love butter cookies! Thanks for sharing with us at the Delicious Dishes recipe party! 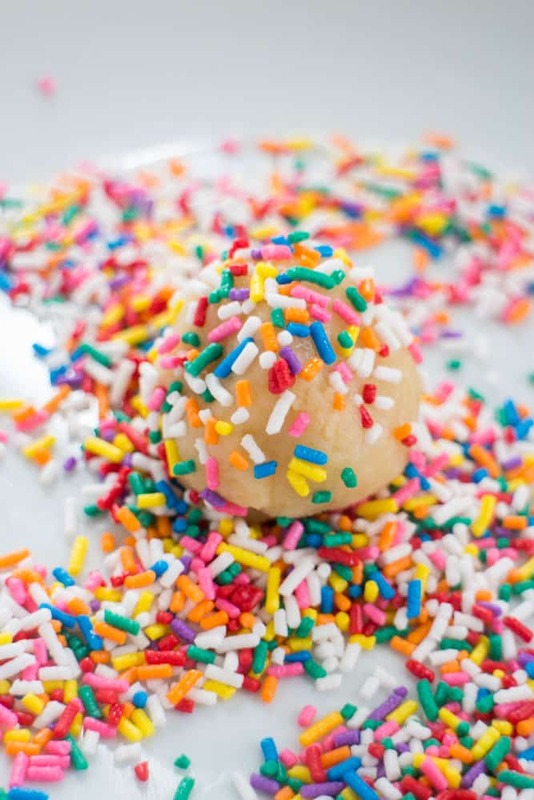 Can you mix sprinkles into the dough? You sure can, but I recommend rolling in sprinkles too if you want the full sprinkle look. These look wonderful! I can see making them for a cookie exchange system. Hi! 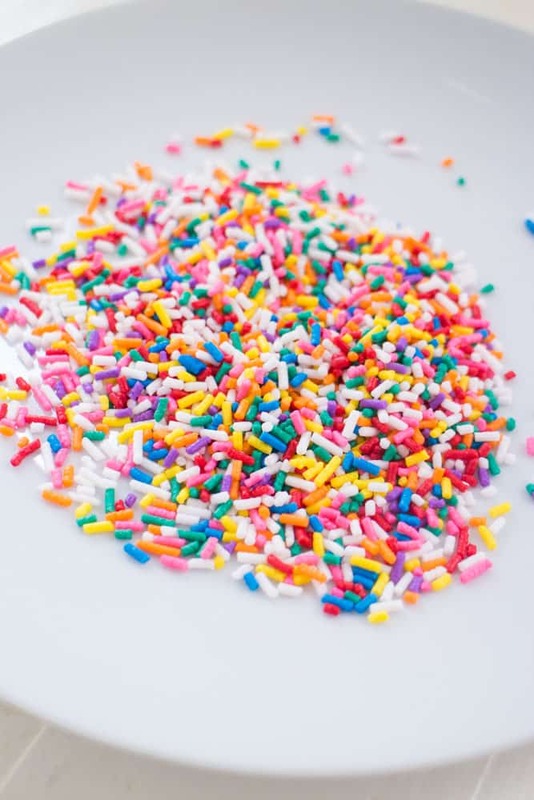 What brand of sprinkles did you use? I love the color mix. Thank you! Hey Melinda! I use a brand called Bakers Choice Colored Sprinkles. They are pretty common in kosher supermarkets here in Brooklyn, http://www.bakerschoiceny.com/itempage-cosp%2016_060-217-216-218.html. Thank you so much. I can’t wait to make these. Love this blog! Hi! I just tested these out to have my students make and they taste great! Could you tell me what brand of sprinkles you used? The jimmies I used didn’t hold up as well as yours did. Cancel that question. I just read your last reply above. Thanks again for sharing your recipe. Hey Melissa, glad you guys enjoyed these cookies! Thanks for letting me know! If you don’t have evaporated milk what could you substitute it with? Hey Michelle, I highly recommend using evaporated milk because that’s what gets them so soft. If you don’t have access to it, then substitute 2 tablespoon milks + 1 tablespoon half and half. These cookies are incredibly easy to make. I just tried them last night, but unfortunately they were a little dry. I used all of the suggested ingredients. Not sure what happened. They were definitely full of flavor. I thought they would be more moist. Hey Tammie – glad to hear you made these cookies, they are one of my favorites! I’ve never had dryness issues with these cookies as the evaporated milk makes them extra moist but here’s a troubleshooting guide that might help you in the future: http://www.bettycrocker.com/how-to/tipslibrary/baking-tips/cookie-troubleshooting-guide. Thanks! They are definitely worth trying again! OH MY GOODNESS These are the best butter/shortbread cookies I have ever made and I have been baking cookies for 56 years. I loved that they were so cheerful looking so I had to try them. I did not over mix the batter so they would be very tender and they were perfect. My oven temperature is spot on so they actually baked for the full 20 minutes. Everyone that makes cookies, likes to eat cookies should try this recipe. I love how bright and festive these are! Those look so tasty! 😀 I will be making these soon!!!!! These look so cute and sound yummy! This is the first recipe for cookies I’ve seen that uses evaporated milk. I’m excited about these! Pinning to try these. My daughter is coming in town in a few weeks and she loves all things sprinkles! OMG I wish I had these in front of me right now. I’d have to hide them from the kids, though, because they look and sound perfect! Thanks so much for sharing at the #happynowlinkup! These look delish – and pretty!! Those are so pretty! 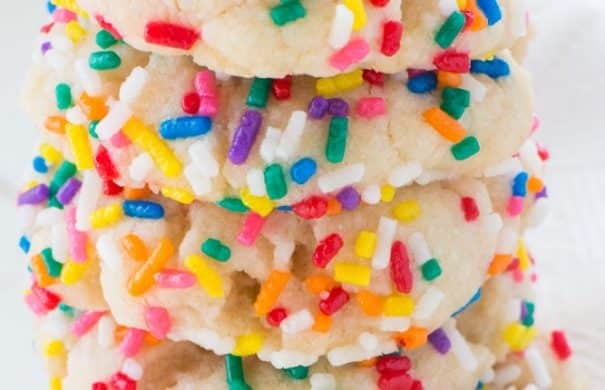 My husband loves butter cookies and my grandkids would love the sprinkles! THESE COOKIES are seriously what my dreams are made of. Some of my favorite cookies. Glad you shared this recipe. Thanks for sharing at the #InspirationSpotlight party @DearCreatives Pinned & sharing. Hey there!! Stopping by from SITS Girls and these cookies look absolutely delicious! I want to make them this weekend! Of course I’m saving them for our next event else, I would be eating them all by myself! Pinned so I’ll be able to make them soon!! These look yummy!! Who doesn’t love a good butter cookie?!?! 🙂 Thanks for sharing with us at #MMBH, pinned this to our board. Woot. This popular post was among the most clicked on the Blogger’s Pit Stop. Congratulations. Be looking for a feature on Friday. Those look like they would be great for the kids I teach sunday school too. 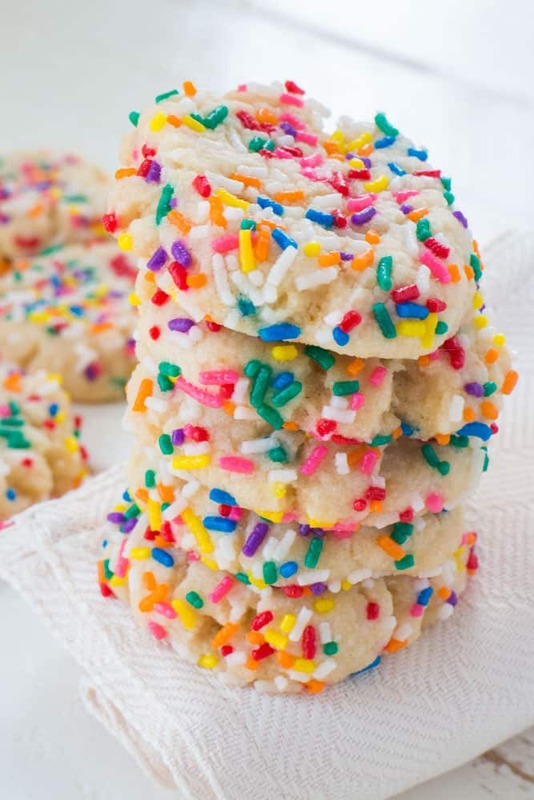 Do you use the softer sprinkles, or the hard ones? Love your photography! These look absolutely delicious and are so much fun! I can tell by looking at these that they melt in your mouth. I wish I could reach in and help myself, they look so good. 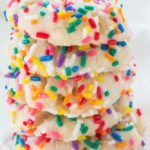 I love sprinkles and this is such a good way to add them without using frosting. They are also so pretty. Thank you for sharing at The Pin Junkie link party. Shared and pinned. My granddaughter and I are going to love these! Thank you for sharing with us at Celebrate Your Story. These are so cute they look like a party come to life. Love all the pretty sprinkles. These look like my kind of cookie! I finally got around to making them and they came out flat as can be. They are still delicious but we are missing that thick, soft inside…and they are homely. I know it’s in the mixing of the sugar and butter. Maybe I overbeat-ed it. I did pass the crumbly stage and went to creamy stage. The butter was on the cooler side rather than real-soft, room temp. I chilled the balls on the cookie sheet for about 20 mins before baking. Any tips you can give me would be appreciated. Thank you! P.S. I make your roasted corn kernels all the time..love them!! Hi there! This recipe looks great 🙂 Do you know how long these will keep in an airtight container? Should they be stored at room temperature or in the fridge? Thank you! Hey Danielle, I recommending storing the cookies in a airtight container at room temperature. They will stay fresh for a few days, but good luck not eating them before then! How do you measure / scoop your flour ? I tend to weigh my ingredients for accuracy but would like to give this recipe a try. Thank you for the recipe! Hey Erin, nothing fancy here, I just use a basic measuring cup to measure the flour. Hope you enjoy the cookies!